Eula Caras Carlos passed away May 22, 2015 at the Andrew and Eula Carlos Hospice Atlanta Center. Eula served on the Visiting Nurse Health System board for 18 years and was instrumental in the planning and ultimate launch of the Center. 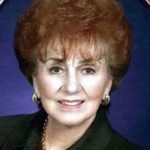 A long-time community philanthropist, volunteer, and member of several boards and societies, Eula was a devoted friend and supporter of Visiting Nurse who worked tirelessly for many years to establish an inpatient hospice facility in Atlanta. Her interest in and dedication to hospice began during an office visit with her physician, Dr. Arthur Booth, when he described his vision of such a facility to Eula. When he told her the only facility of its kind in the south was located in Daphne, Alabama, Eula became inspired to bring a hospice inpatient unit to the residents of Atlanta. From that day on, Eula and Dr. Booth, together with their spouses Linda Booth and Andrew Carlos, began the journey to make their dream a reality. Eula became a founding member of the Visiting Nurse auxiliary which became the Hospice Atlanta Center in 1996. “I am so glad that she spent such good days loved by the people in the facility that she helped make possible. She had the soft landing that she and Arthur always talked about in hospice care,” said Linda Booth. Eula’s husband and best friend, Andrew, and her eldest son, Chris, predecease her. She is survived by her three children and their spouses—Jimmy and Helen Carlos, John and Elaine Carlos, and Helen Carlos and Ron Hilliard—and many grandchildren, nieces, nephews and godchildren. The Carlos family requests donations may be made in Eula’s memory to Visiting Nurse Health System and Hospice Atlanta Center. Donations can be made here, or by calling 404-215-6010.